I love that, I’ve been telling Mike to do that for years, because IDK if you know we live in Montana on the border of Canada and now that logging has shut down because they are moving to Gerogia and other places where they can grow a tree and make a log in 20 years, so we’ve become a much more industry. There are Canadians everywhere and they care about what they eat, they support our Health food store, we have a great healht food store becuase of the Canadians…. I talk a lot about I usually work a lot almost always have a full time job where as he does more of the gardner, but I think a lot of my listeners are more like me who building a raised bed would be hard, not maybe because Im a woman, but because I am just not a perfectionist and to nail 2 boards the same way would be a challenge for me like my personal quirk … and just I think this is a great idea for busy people. Gardening in that sense… there isn’t a time in my memory where that wasn’t present. I’m from a very rural area where there are more cows then people… I had a Tom Sawyer childhood … my front yard …. 800 acres of pine forest…. So it’s really woven into the fabric of who I am… I think in that generation, I think there’s a lot of people, who had a similar experience as compared to the hyper-consumerism we have today…. …. From a competing standpoint, I think it’s important to compete! Yes, there is a premium that can be charged for it, that premium does help, it helps the small farmer … more crucial for pound for pound self space to really compete against those types of producers! We have to protect our planet! It isn’t a stretch to say that nature is considerable smarter then we are! organic guy there’s a lot more heart! You can almost taste that! It really comes through, they say, that’s why it tastes so much better. Because we are not beating it into submission. Is that how you learned how to grow organically? There’s all these steps and various things you can do… that nature has already figured it out… you don’t have to get fungicides etc… nature has had the answer with 3 billion years. if not more…. That you have put together. The first being soil is the most important component. It’s the foundation of everything. That’s how you get these things to grow… that’s why ORGANIC IS vastly superior … not even a close second! COOL, I’ve always felt it should be that way, I don’t understand why organic cost more? It seems like, I’ve always believed we just need to support it and invest in it and it will come out ahead. It has too doesn’t it? 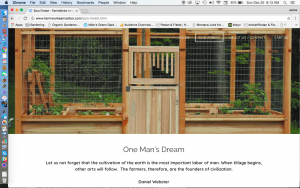 FarmWorks creates it’s own soil. We literally just got this property here, and it’s like my own laboratory here! We make our own soil, we call it gold dust! WE have a 2000 square foot shop that we work out of, and then we have an acre and half strictly committed, to soil and that makes my customers very happy! from the extent that I want to talk about it, there’s a lot of info about how to make soil, so what we did was create our own recipe. We do all of our own composting, from various materials! When you live in rural michigan there is an abundance of compost materials you’lll never run out of it! idk, maybe Michigan is different in Montana, but a lot of people I talk to to, the dirt is the biggest challenge where to come up with that good dirt, we have that challenge every year where to come up with fresh dirt to replenish our beds or build new beds…. Drop call … the most fresh water…. So the chicken thing kind of answers the what are you excited to do now…. Now you can get an Organic Gardener Podcast discount at organifi.com use promo code OGP16 (that stands for Organic Gardener Podcast 2016) at checkout for a 15%discount! That initial milling process … it’s a lot of work, the end result is fantastic and it’s a very economical way to do it, because you simply invest in the equipment you have no product, you create your own product, but it’s work to get to that point. I can tell you taht, that’s probably my least favorite. Well, Mike’s done a lot of that, probably more when I wasn’t around, what amazes me that he’s don’t recently is peeled the posts and poles to build the fence, chop the tree down, peel it, dig the post holes! Your beds are beautiful, the pictures on your website are gorgeous anybody would want those! I kind of just like to take it all in! I really do! I love taking pictures of that stuff… finding the right angles, especially when things are in bloom, when it’s a nice clear, kind of Kodachrome type of day. Those types of things really inspire me to keep pushing, keep pushing … where else can we go with this stuff? I come in and I design and build their systems for them, they come in after the fact and plant them and the results are absolutely spectacular! But I love visiting them and talking with them, and everyone’s always excited! Can I ask you as a side note… I’m so obsessed with business. What was it like finding your first client. Was that scary? Maybe since you come from corporate and said you had a background in some sales … for me, and as Mike and I are starting out, the marketing part is the scariest. FARMWORKS Builders.com and that’s where we will bring in folks like you and Mike and we will train you. This is how we do this. Marketing 101 and Operations 101 based on the 7 years that I’ve been doing this now, and every good bad and everything that I know. This is how we approach it. Marketing really is … there’s a plethora of information with how to be a very good marketer… but you have to start with who is your customer? What would they ultimately respond to? Put yourself on the couch, what is it that they would like to see? What is going to resonate with them and then what they would ultimately respond to? And you kind of work it backward from that point forward. imagine, most people, when you re are buying products, you’re going through a retail channel. When you go to the grocery store, they are not producing anything on the shelves… they’re housing. So consumer direct is removing the middle man from retail standpoint is not there… So on tv that is 1-800-555 … call now…. So how did you get your very first customer? So now your in Michigan do you have to start all over finding customers again? 16 hours a day, everyday, it was so rewarding because you know you’re doing your own thing… it was fantastic …just for a variety of reasons, I needed to find more space and to realize the full potential of where I saw this and being from Michigan it was easy to say let’s close things down here and let’s recalibrate things in Michigan and take it to the next level. I’ve always told Mike he should go make raised beds for my mom, because she hasn’t really grown vegetables in raised beds, and I think she would love it… I don’t think I would ever have a garden again, to me if you can’t sit on the edge of the garden forget it…. realize planting basil with your tomato benefits them tremendously! it was huge moment and to be able to take that and really run with it! I look at it like a composer, like Mozart …20th c composer … absolutely beautiful piece of music …. 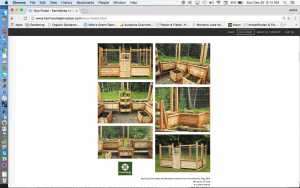 I look at companion planting … they all work together …. they create melody and harmonies … it just excites the heck out of me… a lot of our systems! WE call it composition garden because you want to compose a garden based on things that grow together! salsa is such a fantastic thing you can take what you have in the garden and mix it up! I love salsa, Im not so good at making salsa but I make a killer guacamole! And of course we’d love if you’d join Organic Gardener Podcast Facebook Community! When people are like Facebook is just about food pictures or stupid cat videos… I just think you should join a Facebook Group… someone took me to Glacier Park over Siyeh pass because of a Facebook Group… I’ve driven over Glacier park and under over 300 times and the number of times I can get out… to find someone to hike is invaluable. and I have to admit I didn’t get facebook back in 2010 till I joined a secret group… I totally agree.. there’s people on every topic, I like the birding sites… that is how we met! Full of info. the guy just put out a book called Tools of Titans: The Tactics, Routines, and Habits of Billionaires, Icons, and World-Class Performers … I picked it up for my nephew as a Christmas present and I was sitting by the fireplace with my dog, just thumbing through it. OK, you have to go check out John Lee Dumas’ site at Entrepreneur on Fire because his website is like that book. Tim Ferriss, is a genius, I have learned a lot from him, the Four Hour Work Week was a huge impact on my life, and it’s not about working a Four Hour week, it’s more about doing what you love, life style design, and doing maybe a 40 hour a week in 4 hours so you have time to do what ou love… I haven’t listened to his podcast in a while. So how does that work, people can franchise with you? It’s like reasonability is gone? I think you are getting a gardening reputation… didn’t I see Detroit has more community gardens then anywhere in the US? So you know him… maybe you could introduce me to him. Part of my team, I’m part of his team….